Yiwu New Huangyuan market is synonymous with yiwu commodity city, although the renovation project completion have one year and a half, in the market surrounding, hundreds of shops which look like simple and crude are facing change. Many businessman from other place select in low rent free period enter into New Huangyuan, they do not in order to make money, some even prepared to put out of their own pocket,the purpose is to make their own shops are away from New Huangyuan market more closer, get favorable position and prior lessee right of store inside the market. 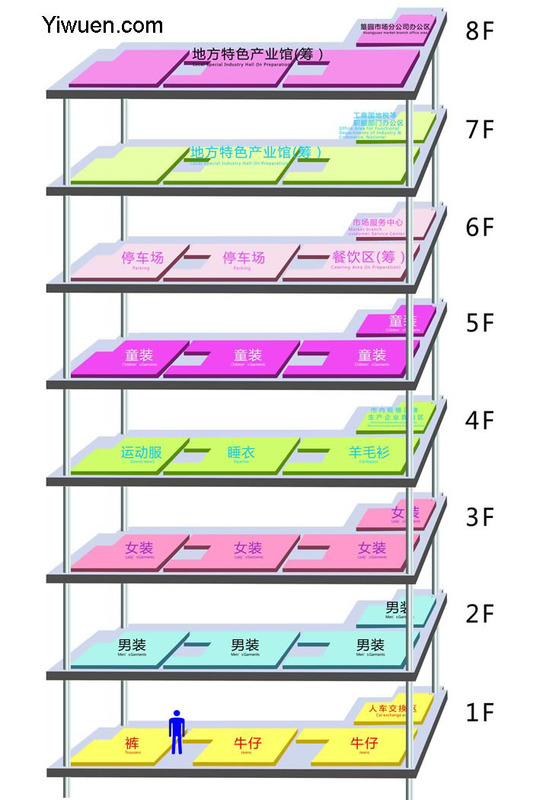 New Huangyuan market reform project consist of subject market and supporting star-rated hotel two items. A total construction area of the market is 36 million square metre. New Huangyuan clothing market operate category combination floor: the first floor for cowboy series, pants, the second is men’s clothing, leather suit, third floor for ladies, the fourth floor for pajamas, cardigan, sportswear, shirts, the fifth floor for children’s clothes. It is reported, at this moment the shop around New Huangyuan market value about 3 million yuan one year, compared with the previous thousands or hundreds of yuan house price, it belongs to the lower. This is also the main reason to attract investors. But, even so, most new owner will have to put out of their pocket to do business. When should New Huangyuan market reconstruction project completed? Staff who worked for New Huangyuan market introduced, at present there are two construction team, dig and construction of sub level has been completed. The whole xinghuang garden market reconstruction project is expected to be completed before culture exposition meeting in 2011. Reconstruction of New Huangyuan market begin after last year culture exposition meeting. According to the company which published listed company on December 25, 2008 announced that after renovation New Huangyuan market’s total construction area of nearly 40 million square meters, project investment capital of 14 million billion yuan. From February 2009 began into construction, completed in the first half of 2010, hotel in plan completed in 2011, the construction time is about 29 months. After reconstructed, New Huangyuan market is a super-large trade building complex, covering clothing, bedding wholesale and retail, commodity exhibition, new product launches, cargo distribution, business affairs hotel, entertainment, leisure catering, and other functions.